Cancun is one of the most popular travel destinations on the planet. But, while millions of people touch down at Cancun International Airport each year, many of them will never leave a ten kilometer radius of the airport! And that’s a real shame. Why? Well, I won’t go so far as to say that Cancun is overrated (*ahem* Cancun is overrated *ahem*), but what I will say is that there is a lot more to discover in Mexico’s Yucatan peninsula than what you’ll find in Cancun. From ancient Mayan ruins, to jungle swimming holes, to magical lakes, the Yucatan offers so much to experience on your backpacking adventure. And, with an awesome network of hostels to support you along the way, there’s no excuse for not venturing a bit off the beaten path! Formerly a sleepy fishing village, Tulum is currently one of the hottest travel destinations in the world. It’s so hot, in fact, that it’s recently become the go-to beach destination for some of the world’s top celebrities (everyone from Leonardo DiCaprio to the Kardashians was spotted there in 2017). What makes Tulum so popular? In one word: beaches. In twenty words: stunningly gorgeous white sand beaches flanked by lush jungle on one side and crystal-clear sapphire water on the other. Simply put, Tulum has some of the best beaches on the entire continent, not to mention beach-side Mayan ruins (but try climbing on them and you’ll get kicked out, as Justin Beiber purportedly did!). With all these A-lister celebs flooding here for their vacays, Tulum is also one of the safest places to visit in Mexico. Fortunately, despite the influx of the luxury traveler set, Tulum has managed to keep its status as a backpacker town. There are literally dozens of incredible hostels in Tulum to choose from, including the all-inclusive (yes, really, there is such a thing as an all-inclusive hostel!) Lucky Traveler Hostel. If Cancun is that spoiled younger sibling who is used to getting whatever they want, Playa del Carmen is the eldest kid in the same family: a bit more sophisticated, but still always down for a good time. Playa del Carmen’s strategic location on the Mayan Riviera means it’s the perfect base for day trips to explore all that the Yucatan has to offer. From here, you can take a dip in several nearby cenotes (underground swimming holes), explore the nearby “ecotourism theme parks” like Xcaret, or venture further afield to see the Mayan ruins at Coba. Or, if all that sounds like too much work, just grab a towel and a beer and head to the beach – it’s walking distance from tons of amazing hostels. The newly-opened Selina hostel is one popular option, owing to its huge pool and wide-open chill-out space, as well as 24 hour security and reception. Mexico’s Yucatan is famed for its incredible oceanfront on the Caribbean. But, believe it or not, some of the best water around here is found in a lake! Laguna de Bacalar is known by the nickname “The Lake of Seven Colors.” And trust us when we say that it lives up to that moniker! The colors of the water here have been known to mesmerize visitors ever since the lake was used as a secret pirate hideout hundreds of years ago. The best way to explore Bacalar is by hopping into a kayak or on a stand-up paddle board. Fortunately, there are several hostels on offer here sporting lake-front property, private docks, and free kayaking and other water sports. Check out The Yak Lake House for its awesome bar, or the Green Monkey Hostel for its stunning location. It’s only a 20 minute ferry ride from Cancun, but the vibe here couldn’t be any more different. This sleepy island is the perfect retreat for those looking to escape it all, and easily one of the best places to visit in Mexico. There is some excellent snorkeling to be had just off the island, including snorkeling with whale sharks during the summer – rather you than me! But otherwise, there just isn’t a whole lot to do here except lounge on the island’s beautiful sand beaches, meander its many shops and stalls, and watch the sun slowly slip down over the ocean. Sounds like paradise right? For an excellent hostel in a great location, check out the ever-popular Poc na Hostel. It’s hard to believe that this quiet village is just twenty minutes south of Cancun, because it feels like a different world. Small enough that the locals all seem to know each other, but with enough on offer to keep you busy, Puerto Morelos is the perfect destination for if you’re looking to get off the beaten path without having to go too far. From zip lining, to swimming in cenotes, to driving ATVs, there’s a lot just waiting to be explored here. And, at the end of the day, you’ll love cooling off with a swim at the pool at Hostel Humanity. There are basically only three ways to get around the island: on foot, by bike, or via golf cart! Whatever you choose, you’ll love exploring the island’s many wild beaches, most of which sport water so shallow that you can walk a hundred meters or more into the sea! This quintessential backpacker-island has several hostels just waiting to welcome you, but you’ll especially love the colorful decor at Tribu Hostel. Say it with me now: Mexico is about more than just beaches! So, if you prefer a bit of culture with your trip, you won’t want to miss out on the Yucatan’s capital city of Merida. Its historical center exudes history, color, flavor, and energy. For a great place to stay in Merida, check in to Nomadas Hostel, and settle into one of the hammocks hanging over its inviting pool. Situated between Tulum and Playa del Carmen, Akumal is best known for one thing… turtles! Year around, Akumal is one of the best places on the planet to swim with these magical sea creatures. Best yet, you don’t need to hire an expensive tour to do it: just rent some flippers and a mask from a stall by the beach, swim out a few dozens meters, and look around for a new green friend. The secret is out about this magical place, though, so here’s a pro-tip: stay overnight at Akumal Natura, and get up early to have some alone time with the turtles before the tour buses from Cancun roll in! Sure, lying on a beach and partying can be fun. But if you really want to experience the Mayan Riviera, why not see it from underneath the water? Cozumel may be best known as one of the most popular cruise ship destinations in the world, but it also offers some of the best diving you’ll find this side of Thailand! Best yet, the island is blissfully quiet in the evenings after the cruise crowd heads back to their ships. 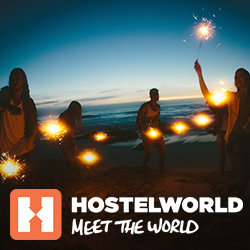 That means the island will be all yours – well, yours and your fellow hostel-mates of course! Popular places to make friends on the island include the aptly-named Bed Friends Hostel and Amigos Hostel. Most tourists only briefly blast through this town on a tour bus on their way to visit Chichen Itza. And, sure, Chichen Itza is one of the New Seven Wonders of the World, so it’s probably worth a visit. But it’d be a shame to miss a night or two in this charming colonial town. Spend your days marveling at its many brightly-colored buildings (perfect for snapping that killer pic for Instagram) and your evenings downing shots of mezcal (think a smokier version of tequila) in a rowdy cantina. And if you need something to cure the hangover the next day, try jumping from a rope into the frigid water of the town’s many cenotes. For a great stay in a Spanish colonial house, check in to Hostel La Candelaria. As you can see, there’s so much to do in Mexico’s Yucatan peninsula besides Cancun! Heck, I dare say that you might even want to skip Cancun altogether. But, wherever you go, the peninsula is filled with lovely hostels just looking to welcome you as a guest! Nate has travelled to over sixty countries across six continents. He blogs about emerging destinations at TravelLemming.com, or find him on Facebook and Pinterest. The post Move over Cancun! Here are the best places to visit in Mexico’s Yucatan appeared first on Hostelworld Blog.